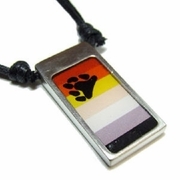 The Pendant is 1 1/8 inches long by ½ inch wide. Made of an enamel inlay in a solid pewter frame. It is nickel free. On an adjustable cotton waxed cord that extends from 16 to 34 inches.